In January we took a short road trip up along the coast to Gualala were we stayed overnight. 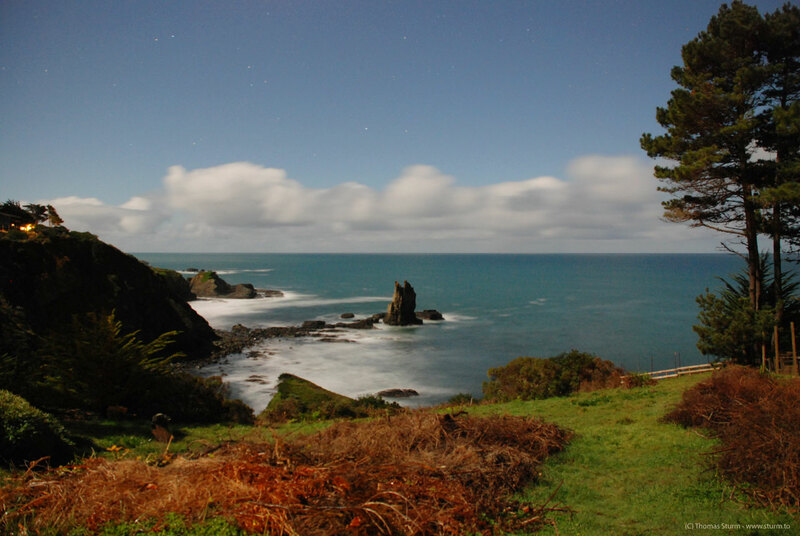 It was a full moon night and we went out for a little photo experiment near Gualala at a small cove that overlooks Castle Rock and the rugged coast in this area. The night was very bright with the moon out and the heavy rain clouds staying out on the ocean and we took some long time exposures with a tripod. What you see below was the most spectacular shot of the night - it's Castle Rock at 30 seconds with wide open aperture and an ISO setting of 800 on our Nikon D80... at about 10 o'clock at night. This was in fact the first shot at 30 seconds and we waited hopping from one leg to the other in the cold night, every breath creating clouds of moisture in the moon light. And when the picture finally popped up on the LCD monitor, we both couldn't believe that this was the actual picture we had just taken! It looked too unreal to be true!